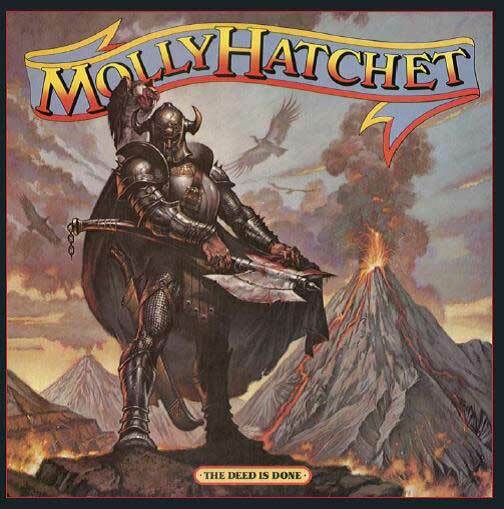 Formed in Jacksonville, Florida in 1971 by guitarist Dave Hlubek, and fronted by singer, Danny Joe Brown, Molly Hatchet were easily able to fill arenas across the States by the time their second LP “Flirtin’ With Disaster” was released in 1979. By 1980, Danny Joe Brown had been replaced with Jimmy Farrar on vocals, and it was this line-up that appears on the first CD of this set, “Take No Prisoners”. When Lynyrd Skynyrd’s plane crashed in October 1977 a mere four dates into their “Street Survivors” tour, many felt that southern rock had died. 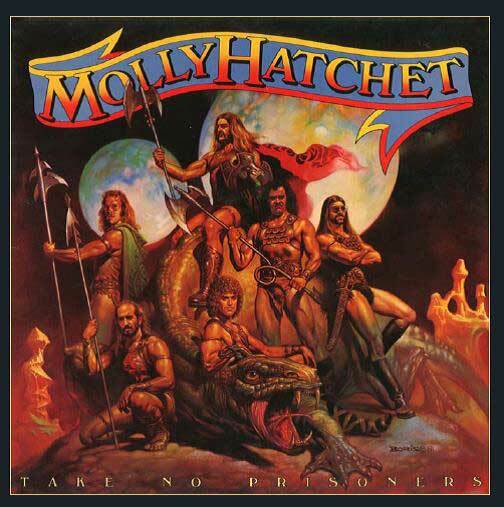 However, the South did duly rise again, with the release a little over a year later of the eponymously titled, platinum debut – from Molly Hatchet. Formed in Jacksonville, Florida in 1971 by guitarist Dave Hlubek, and fronted by singer, Danny Joe Brown, Molly Hatchet were easily able to fill arenas across the States by the time their second LP “Flirtin’ With Disaster” was released in 1979. By 1980, Danny Joe Brown had been replaced with Jimmy Farrar on vocals, and it was this line-up that appears on the first CD of this set, “Take No Prisoners”. Whereas their first three long players had been housed in sleeves painted by famed artist Frank Frazetta, it was fantasy illustrator Boris Vallejo who painted their latest opus. 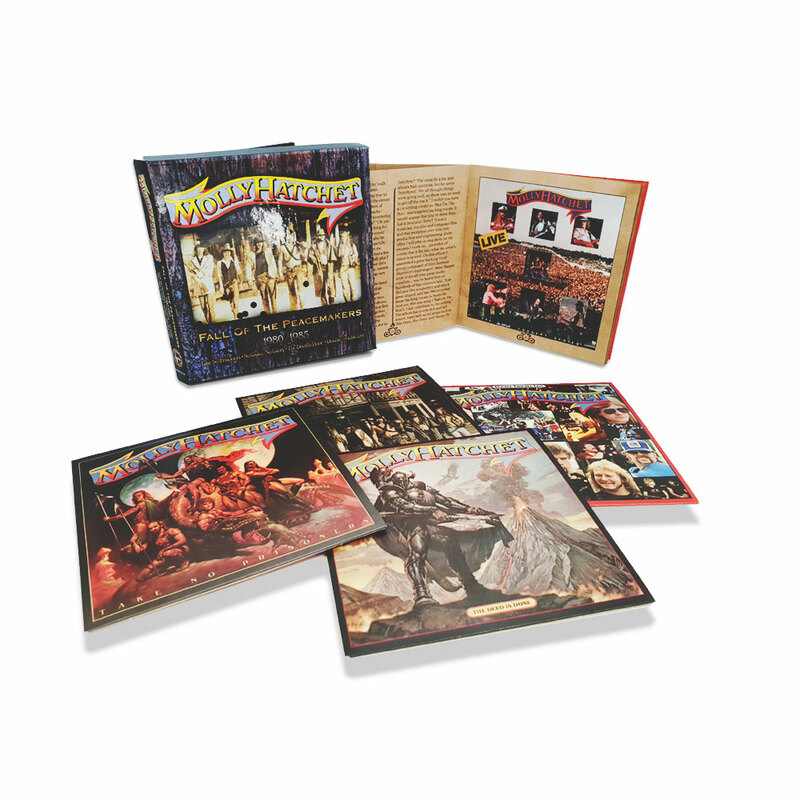 The album now includes radio edits of ‘Lady Luck’ and ‘Power Play’, as well as a memorable run through ‘Mississippi Queen’, with Molly Hatchet joined by Ted Nugent. On stage is where this band pulled no punches, and it’s no surprise that their label released exclusive, vinyl only promo LPs to radio stations, with CD1 completed by a show recorded at Lakeland Civic Center Arena in 1980, and simply titled “Live”. By the time that 1983’s “No Guts… No Glory” was released, Danny Joe Brown had returned to the mic stand, and again the band were joined by famed producer Tom Werman twiddling the studio knobs. CD2 of this set is now expanded to feature ‘Kinda Like Love’ (Radio Edit) and ‘Fall Of The Peacemakers’ (Short Version) as bonus cuts. 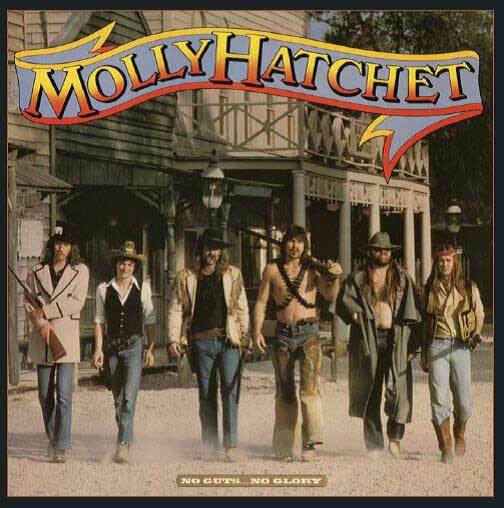 By 1984, Molly Hatchet felt that they needed to emulate some of the commercial sheen shown by fellow southern rockers ZZ Top, who’d been catapulted to superstar status with the release of “Eliminator”. Enlisting the latter’s recording engineer Terry Manning to produce their new record certainly made “The Deed Is Done” a more radio-friendly prospect, as well as the welcome return of an axe wielding, armoured warrior on the cover. “The Deed Is Done” has been expanded to include radio singles ‘Satisfied Man’ (Short Version) and ‘Stone In Your Heart’ (Radio Edit). Apart from the aforementioned radio promos, and illicit, under the counter bootlegs, Molly Hatchet had been ill-served with live releases. This was to be rectified with 1985’s “Double Trouble Live” 2LP. As well as the 80s repertoire that had now become staples of their set, the band were also able to include live versions of older classics ‘Bounty Hunter’, ‘Gator Country’, ‘Flirtin’ With Disaster’ and the epic, ‘Boogie No More’, as well as their own tributes to their fallen, Jacksonville brothers, Lynyrd Skynyrd’s ‘Freebird’, and The Allman Brothers Band’s ‘Dreams I’ll Never See’. There are few greater authorities on the history of Molly Hatchet and southern rock in general than Kerrang! magazine’s Xavier Russell, who had the good fortune to see live in concert, and to interview in person, Molly Hatchet in their prime. Across 4,000+ words, Xavier tells the story of these albums in detail, based on interviews with guitarist Dave Hlubek, as well as producers Tom Werman and Terry Manning. 1. WHAT DOES IT MATTER? 5. WHAT’S IT GONNA TAKE? omitted from the original CD release to fit the album onto one disc. 5. WHAT'S IT GONNA TAKE?